Historical prices for the Standard & Poor's 500 stock-market index can be obtained from websites like Yahoo Finance, using the ^GSPC ticker, or Google Finance, with .INX. Yahoo can even graph the series since 1950. Those numbers, and their corresponding graphs, are useful for evaluating the past performance of stock investments, because the S&P500 index is well regarded as a proxy for the large-cap stock market. Nevertheless, to study the real profitability of the market, we need to average and graph not only the price, but the effect of dividend distributions and inflation as well. That is the purpose of this work. The effect of investing $1 in 1950 is seen. The orange curve shows the result of having all dividends reinvested (i.e., the total return), while the blue curve disregards dividends, therefore reflecting only the evolution of price. 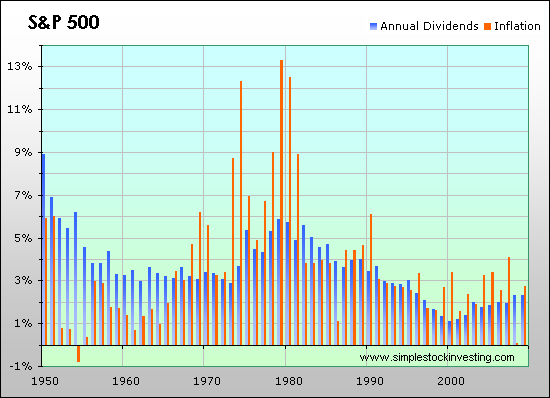 As can be seen, reinvesting all dividends produced about 8 times the return. Note that the y-axis is logarithmically scaled, for better appreciation of the earlier trends. Phrases like "one dollar invested in 1926 would be $3000 today" are often heard regardless of the fact that a 1926 dollar has little relation with a 2009 dollar. To evaluate properly how much can be earned through stock investments in a long period of time, the effect of inflation has to be extracted from the picture, by adjusting the intermediate results according to an index such as the Consumer Price Index published by the U.S. Department of Labor. 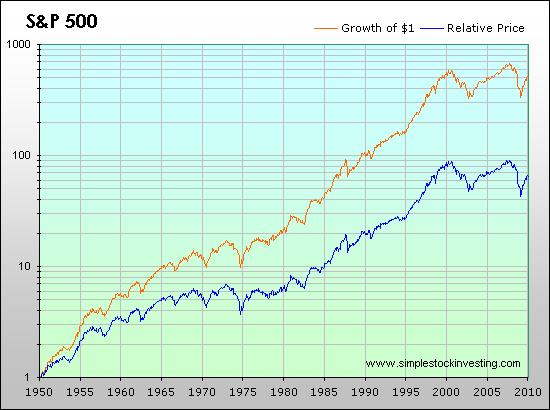 As we observe in the graph, in recent years the stock market delivers more of its profits through capital gains. You can also see the high inflation rates that occured in the 1970s. 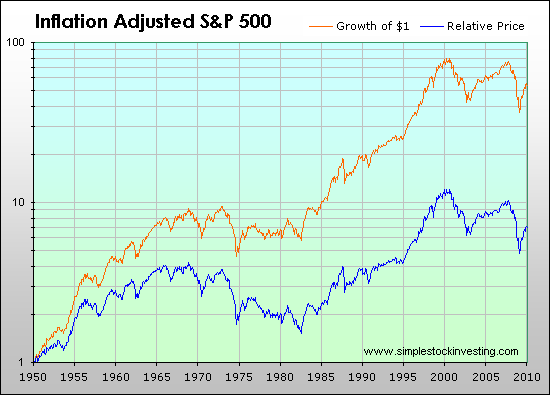 As can be seen, the stock market was very profitable, in real terms, in the 1950 to 1965 and 1983 to 2000 periods. On the other hand, it didn't perform well from 1965 to 1983, and neither it did for the last decade. Still, during these periods, it partially worked as a shelter from inflation. "S&P 500: Total and Inflation-Adjusted Historical Returns"